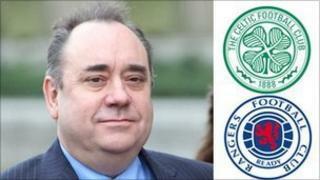 Celtic FC has attacked Alex Salmond for saying the club needs bitter rivals Rangers to prosper. Mr Salmond reportedly told the broadcaster Al Jazeera: "Celtic can't prosper unless Rangers are there". He was responding to questions after Rangers was placed in administration. In a strongly-worded statement, Celtic said it was "disappointed" and did not wish to see its position that it could stand alone being "misrepresented for political reasons". Mr Salmond later blamed the issue on a misunderstanding. Mr Salmond's comments were reported to have been made during an interview with Sir David Frost, which is due to be broadcast on Al Jazeera English on Friday. He reportedly said: "Obviously HMRC have got to pursue in the public interest, taxation. "Equally, they've got to have cognisance of the fact that we're talking about a huge institution, part of the fabric of the Scottish nation as well as Scottish football, and everybody realises that. "The most diehard Celtic supporter understands that Celtic can't prosper unless Rangers are there. "The rest of the clubs understand that as well. Therefore you have to have cognisance of these things when you're pursuing public policy." On Monday, Celtic chief executive Peter Lawwell told the BBC that his club did not need Rangers. Speaking about the possibility of the Ibrox club going bust, he said this "would have no material effect on Celtic". Mr Lawwell added: "We look after ourselves. We don't rely on any other club. We are in a decent position, we're very strong." After Mr Salmond's comments were reported on Thursday, Celtic released a statement re-asserting this position. It said: "We are very disappointed with the first minister's claims that Celtic 'need' Rangers and that Celtic 'can't prosper unless Rangers are there'. "This is simply not true. In a series of interviews given just three days ago, we made it abundantly clear that Celtic has a well-defined strategy and a business plan independent of the fortunes of any other club. That remains absolutely the case. "However, we are extremely well-qualified to make our own position clear and have no wish to see this being misrepresented for political reasons."